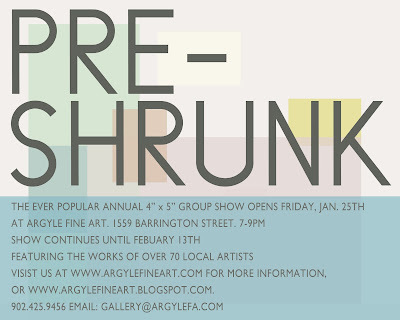 In the spirit of kicking off 2013 with a bang, I’m very excited to announce that I’ve been accepted into Argyle Fine Art’s Pre-Shrunk show! This will be my very first time having work shown in a gallery! INTERNET HIGH FIVES! Ahem. Last fall on one of my visits to the gallery, I spotted a call for artists for this show. Pre-Shrunk is a show of 4″x 5″ works both from new and established artists. The goal is to make affordable art available to everyone. The fact that it was open to all artists caught my eye immediately, and I figured, why not? I was especially intrigued by the small canvas size, which was ideal since I wouldn’t have to dedicated large blocks of time to it in between school work. Nothing to lose by trying, since every painting I do helps me grow. This will be an incredible opportunity to have my work seen by the public, and to play meet ‘n greet with lots of other artists in the HRM. I’m beyond psyched to have gotten in and can’t wait to attend! This is one of three paintings I submitted to the show. All three are acrylics on canvas board, 4″ x 5″. They were very fun to paint! It was a little restricting to paint that small, but at the same time it was very rewarding to finish a piece so quickly. When trying to come up with an idea for what to paint for this show, I was a bit stumped. Fortunately I received an early xmas gift of some colorful items that instantly inspired me! All three paintings feature elements that I really enjoying rendering, from shiny reflective surfaces, to bright colors, to pretty things. Come on out from 7pm-9pm on Friday the 25th of January to Argyle Fine Art in downtown Halifax to see my work! I’ll be hanging around for a bit as well, taking in all the other amazing art that’s bound to be on display. See you there! It started with me seeing colorful fashion photography that immediately caught my eye and inspired me. Back in January I bought a huge (24″ x 36″) canvas with no project in mind, and it wasn’t until April that I began laying down the first sketch. Now, I’ve finally finished the most ambitious painting I’ve done to date! VOILA! I learned so much through the process of this painting along every step of the way. When sketching, don’t use pencil that’s too dark. When working on the under-painting, be careful to keep layers transparent and thin so there won’t be ridges of paint left over. Give yourself a break every half an hour or so to stretch or your back will hate you. If you’re stuck on something, sleep on it. The list goes on and on. Throughout the painting, to help keep myself on track, I made lists of things left to do or things I needed to fix. As I finished those things and crossed them off the list, I could see how much progress I was making. I could have spent forever fixing things and trying to make them perfect; this painting is riddled with imperfections, but the point of this painting was not hyper-realism. In fact, the differences and imperfections are what help make the painting mine (as much as a painting studied from a photograph can be). I wanted to paint something huge, something colorful, something where I could learn more about skin tones, anatomy and fabrics. I wanted to challenge myself. This painting felt like a “final project” in a lot of ways. I spent the past few years studying and preparing a portfolio to get into art school (first day is tomorrow!) and this is the culmination of all the self-discipline and things I taught myself. My favorite parts to work on were the faces and background fabrics, and the parts I like least were the hands and the dress in the middle. With this painting now hanging in our living room and off my easel, I feel like I can go to school with a (mostly) clean slate.